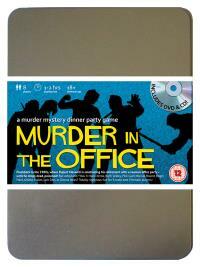 You've been invited to play the role of DONNA NEES in Murder In The Office. Who killed the boss? Everyone has stayed after work to attend Rupert Maxwell’s retirement party. Not because they like him, but because they want to make sure he is really going, once and for all. With no expense spared, his P.A. has organised an Eighties throwback disco and the cheapest bubbly money can buy - but just as the party starts the bloated M.D. falls down dead. Find out who made Maxwell’s party a real choker! Maxwell’s P.A. (she took a load off Maxwell every day!) Costume : In a skirt cut to the knee and flower print blouse, you make the perfect P.A. With your hair pulled tightly back and glasses attached by a chain around your neck you’re ready to tackle any job – and a Dictaphone allows you to take notes on the move. You have worked as Rupert Maxwell’s Personal Assistant ever since he founded the company over twenty years ago. You have dedicated yourself to making Maxwell’s life easier in any way you can and you are proud to have been able to contribute to his success. It was your idea to throw an Eighties-themed retirement party in honour of Maxwell’s early days as Managing Director.